The third season premiere, "Tin Man Is Down," corrected for the show's old, over-the-top thrills with tedium. The first time we see Dana Brody in Homeland Season 3, she’s receiving a talk on how to face the fallout from the fact that her father may have perpetrated the biggest terrorist attack on America since 9/11. “What coping mechanisms come to mind?” asks a rehab-clinic staffer. Here’s a Carrie Mathison-worthy conspiracy theory: That scene is semi-autobiographical for the people behind Homeland. After all, they underwent what must have felt like a world-shaking betrayal when the goodwill and acclaim that surrounding the show’s Emmy-winning first season evaporated midway through the second one. Sure, that was because viewers themselves felt betrayed by the way the writers combined a far-fetched, unsexy central love story with a tangle of intellect-insulting twists. But as Homeland has displayed time and again, this is how the world works. One grievance begets another. The wounded wound the wounded wound the wounded. Facing backlash, the creative team—after a couple staffing changes—apparently collaborated on some coping strategies. “As we move forward that we're going to let the spaces between those story twists breathe a little bit more,” showrunner Alex Gansa told The Huffington Post’s Maureen Ryan. “Not because we think that's better, but because at some point you have to keep it credible.” In other words: We talked about really slowing things down so they’re not so overwhelming. Which explains a few things about the season premiere. It explains the amount of time spent with characters stiltedly asking questions we already know the answers to. It explains why many conversations ended with one party flashing a silent grimace rather than, well, saying something. Why so many scenes lingered on scenery or blank faces a beat or four after the action concluded. This is Homeland with a governor, self-consciously stalling with sequences that teeter between character/plot development and filler. But that wasn’t the main reason this season premiere felt bafflingly boring. It’s that the stakes were so low. Homeland’s original appeal rested on a delicious mystery: Is a war hero secretly a terrorist? Once that mystery was solved, new ones—less provocative but still compelling—emerged: Can he be stopped? Can he turn good again? Is he playing an even longer con than believed? Carrie served as an erratic but magnetic viewer proxy for solving these puzzles, and Claire Danes’s fabulous performance generated as much conversation as the plot riddles. She and other well-drawn characters added texture and thematic depth to the pulpy narrative. But Carrie/Claire wasn’t, at heart, the reason people obsessed over the series. Finding out what happened next was. Homeland’s writers sent Nicholas Brody away in its Season 2 finale, in part, Gansa has said, because they suspected that his character wouldn’t be interesting for much longer. That wasn’t a terrible idea. There’s only so long you can have a maybe-triple-agent on the lam and dating the protagonist. Perhaps admirably, “Tin Man Is Down” forgoes checking in on him and instead demonstrates his absence’s impact on the other characters: the Brody family gingerly figuring out how to carry on, Carrie desperately taking home the first redhead she comes across at the grocery story, the CIA and US government nominally on the hunt for him. But there was a big, tantalizing mystery Homeland left us with at the end of last season: Who bombed Langley? For now, frustratingly, the show has dropped that mystery. We see that the government and the public believe Brody to blame and that Carrie believes otherwise. That’s not new info, though. What detective work or deductive reasoning has Carrie done in the months since the blast? Viewers get glimpses of her platitude-filled notepad and wall collage, but don’t learn anything about the substance of her musings. There’s a brief mention of a new big baddie with ties to Iran. But most of the episode devotes itself to the umpteenth round of Carrie allowing herself to descend back into mania and Saul Berenson grappling with what the show has, apparently, decided will be its new driving plot conundrum: Can the CIA survive? But who cares if the CIA survives? I understand that Homeland wants to unveil the truth about the Langley bombing slowly and artfully, but it’s troubling that the writers believe they can put it entirely aside for the premiere and substitute in an hour of bureaucratic backbiting and pat domestic drama. Because by lowering the stakes, the things that made the show good stop working very well. That clandestine CIA operation with Quinn, for example, was tense enough and bore the signifiers of Prestigious TV Filmmaking (dead kid! ), but ultimately felt inconsequential because the overarching motivation was merely to prove that the CIA can still get things done. 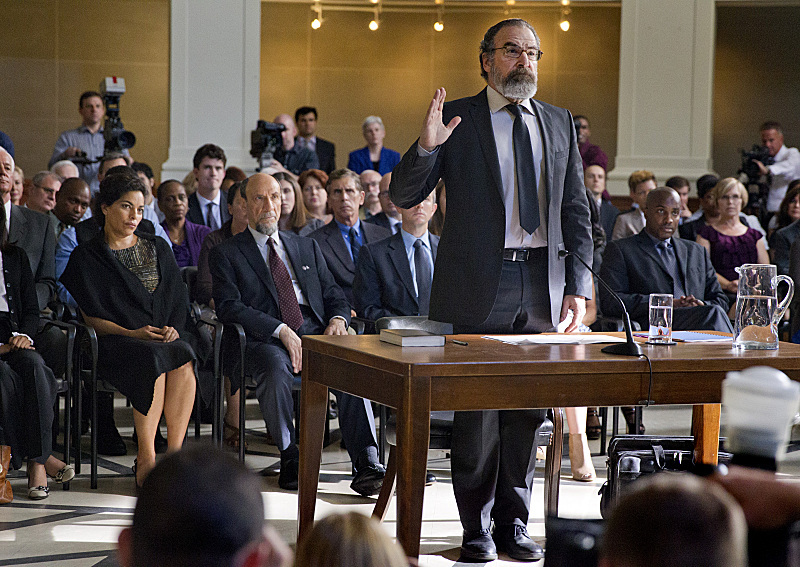 Worse, without its old urgency, Homeland’s flaws become all the less forgivable. Take the Brodys. Their home life has never thrilled, but now the time we’re forced to spend with it verges on intolerable. That’s partly because the characters other than Dana just don’t have much depth (what’s with Jessica Brody’s strident lack of sympathy towards her suicidal daughter?) and partly because their dialogue is so very boilerplate. Yes, this is meant to be an Everyfamily, so a certain amount of blandness makes sense. But when, say, the grandma greets her granddaughter’s arrival with “You look so skinny,” the characters move further from real-seeming people we should care about and closer to abstract embodiments of the toll that war takes on the home front. This is only the premiere, of course, and Homeland isn’t quite past being worth getting the benefit of the doubt. There are signs of improvement, most notably with the cliffhanger where Saul sells out Carrie on national TV. That’s a sign that the show is finally moving to address the fundamental implausibility that SNL got at with Bill Hader-as-Saul saying of Carrie, “she's only let me down every time I've trusted her, give me one reason not to trust her again.” Promisingly, Quinn and Dar Adal both exude menace and intelligence that hints they’ll be fascinating key players. And Danes’s face and delivery remains as richly expressive as ever. Maybe in an episode or two, the show will start offering up a smarter, more considered version of the big, dumb plotting that made it fun to begin with. Maybe then tonight’s tedium will pay off. For now, though, the show seems shell-shocked and adrift, the result of overcorrecting for the previous season's excesses. There’s reason to worry that Homeland, like its characters, may never recover from the traumas inflicted on it.